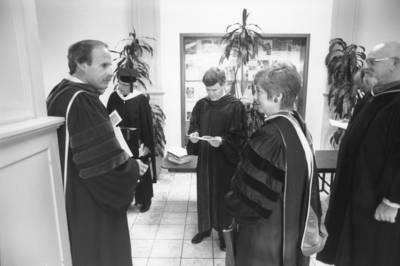 "Faculty, commencement day, Chapman College"
Left to right: Steve Shandler, Jim Miller, Myron Yeager, Barbara Tye and Ron Thronson, commencement day, Chapman College, Orange, California, ca. 1985. BW photographs; 5.75" x 8.5"